Bring on the Spinach, but Don’t Forget to Wash it First! I am a big fan of spinach and consume most of my spinach in the form of salads. Although it is considered to have many health benefits when eaten fresh or lightly cooked, some believe that nutrients can be lost when it is frozen. I always knew spinach was a healthy choice, but recently learned a bit more about spinach, its health benefits, and even a few cautions. Please read to the end of the post if you would like to check out our two favourite spinach salad recipes. If you are like me, then you too probably love the idea of buying the pre-washed containers and/or bags of spinach and other greens. However, in recent years, there has been new information regarding these pre-washed packages. It is really important to wash all of your fruits and vegetables. Don’t be fooled by the “pre-washed” advertizing on the label. Generally, rinsing really well under cool water is enough, but there are other options available. Personally, I couldn’t live with out my salad spinner to remove the excess water after washing. For an extensive guide to washing fresh produce, follow this link. Spinach is one of the foods that was named on the ewg.org (Environmental Working Group) “Dirty Dozen” list of foods contaminated with pesticides. When considering buying organic, the “dirty dozen” list helps you to make choices that fit your pocketbook by highlighting those foods that are considered to be the most contaminated. They also provide a list of the “clean fifteen”. Again, their lists can help to guide your shopping and enable you to make well-informed choices when deciding whether to buy organic or not. Follow the ewg.com link to check out the lists. Some cautions have been noted for those with kidney or gallbladder problems as the oxalates in spinach may interfere with the absorption of calcium and could possibly crystallize. 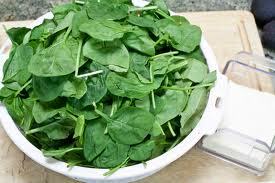 It has also been suggested that those with thyroid problems may find spinach more reactive (causing inflammation). This could possibly be reduced by purchasing organic and cooking your spinach. Place dressing ingredients in a jar or other container with a lid. Shake and pour over salad just before serving. Toss and serve. Yum! Yum! Yum! This is one of our favourite dinner salads. The dressing is delicious and the presentation is truly gourmet restaurant style! You will love this. It reminds me of the Boston Pizza Spinach Salad. I found this recipe online at the food network. Don’t be grossed-out by the bacon drippings (fat) that is used in the dressing. Mark my words, that is the secret ingredient that makes this dressing a step above all others. Enjoy! Posted on July 18, 2013 by Cindy Roy •	This entry was posted in Health and Wellness, Recipes, Salads & Vegetables and tagged antioxidants in spinach, buy organic, contaminated greens, contaminated spinach, dirty dozen, health benefits of spinach, spinach, spinach salad, spinach salad recipes, Spinach Salad with Strawberries, Spinach Salad with Warm Bacon Dressing, yummy spinach salad. Bookmark the permalink.